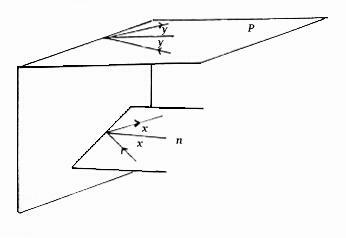 When a ray hits a point p on the surface of a three dimensional region, the incident ray, the reflected ray and the normal to the tangent plane at p must be co-planar. 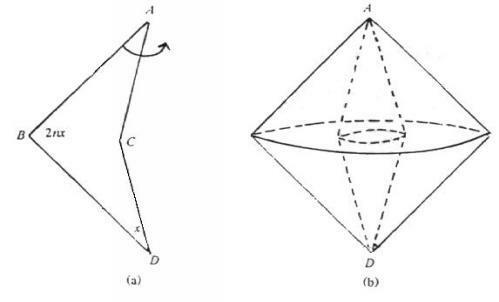 We call the plane formed by these three vectors the reflecting plane. Let us assume that any ray hitting a vertex or an edge does not reflect. In here, we discuss how to build polyhedral non illuminable regions. The idea behind this proof is to reduce the cylindrical region C to a two dimensional region. An example of such a region is provided in figure 1. Given any point x in C, let us examine the orthogonal projection of the rays out of x onto the base S. Consider a ray r out of point x that hit one of the walls at a point p in such a manner that the reflecting plane of r at p is perpendicular to the base S. Then, he projection of r onto S preserves the the angles. This implies that reflection is preserved by the projection. Now consider rays out of x that create reflecting planes not parallel to S when they hit the wall. Because the wall is perpendicular to the base S, the orthogonal projection will preserve reflection even if it does not preserve the angles (see figure 2). (maybe several times) this would look like the first reflection in the projection plane. Therefore, any ray out of x reflecting on the wall can be reduce to a projection onto S.
We can therefore conclude that the path taken by rays in three dimensional cylinder C, reverts to an orthogonal projection on base S. Since the shape of S is not illuminable, there exists a part of C, projecting orthogonal onto S that will never be reached from a point p. For example, in figure 1, any ray leaving A0 will never reach A1. Given a cube with one corner labeled A there does not exist any ray leaving from A coming back to A. The proof is very similar to the two dimensional counterpart's one. You build up a lattice of mirror images of the cube (figure 3a) with A as the origin and the vertices having integer coordinates. A pool shot from A to A, requires that a ray passes through a vertex, which is impossible. Note that this also applies to any point on the edges containing A. There is no ray leaving an edge with vertex A that will reflect back to itself. Figure (3b) shows a polytopal room which is not illuminable. This room is built by following the following rule. Any edge not attached to vertex A must remain an edge. Figure 3 - (a) In a cube, no ray will leave point A to be reflected back to point A. (b) A non-illuminable region built by intersecting many cubes. another point labeled with an A. 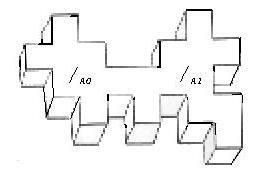 We simply take the two dimensional non illuminable object represented in figure (4a) and rotate it about the axis AD. We obtain the object shown in figure (4b). Then there are no rays leaving A or D that will be reflected back to A or D. The latter shape is particularly interesting since it suggests some possible applications in acoustics or thermodynamics. Exercise - prove that the object of figure 4b is not illuminable from either its vertex A or D.
Exercise - build other non-illuminable solid using smooth surfaces. Is there a three dimensional counter part to the Penrose mushroom which is non cylindrical? (b) Non illuminable polytopal object build by rotating the shape in (a) around the axis made by AD.